If you are a firearm owner you know you should have a safe, it is by far the best means of protecting your firearms. But a huge, heavy and expensive floor safe is not for everyone. Those with smaller houses or apartments many not have the room. Many gun owners, even those who already have a floor safe, wish there was a way to keep at least some of their guns close at hand AND secure. The answer? An under the bed gun safe. 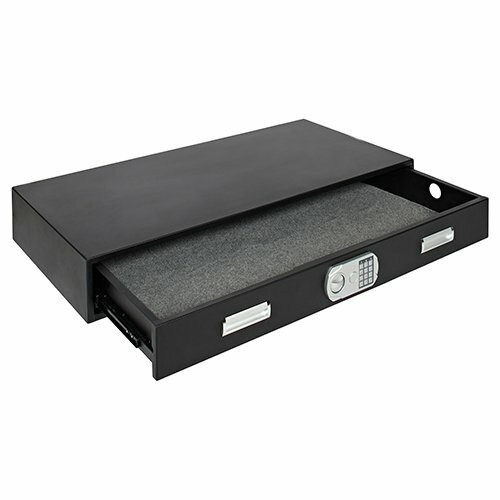 Under the bed gun safes, as the name implies, are designed to be stored under your bed rather than upright. Depending on the size of the safe you select they may also be installed under a couch or similar piece of furniture. For those with limited space this allows firearms to be kept in your home and secured without sacrificing valuable square footage. If you are concerned about self-defense the under the bed safe permits you to keep firearms close at hand while you are most vulnerable ( sleeping) without tucking it under your mattress or pillow – something which should really only happen in the movies. If even a small part of owning a safe is for self-defense it is vital you be able to not only access your firearms, but do so quickly and easily. When selecting an under the bed safe you need to look at how it is mounted, how difficult it is to reach and how easy it is to open. The best designs will allow the safe to be mounted under either side of the bed, able to be opened without moving the bed and if the safe needs to be moved it should be done easily, finally the locking mechanism should make gaining entry a snap. Any safe you purchase must be safe from unwanted intruders or curious children, after all that is why you buy the safe to begin with. When determining how secure a safe may be consider the thickness of the walls, whether locking mechanism is able to prevent unauthorized opening and how the safe is secured against removal. Bonus features to consider include fireproof rating, protection against water damage and any warranty the manufacturer may provide to compensate if your firearms or safe are damaged. A safe’s locking mechanism can be operated in a variety of manners including a key, combination, biometric (fingerprint) or passcode. Each has its own advantages and disadvantages. Key or combination locks are less secure, especially if there is the possibility someone may learn the combination or copy the key. However, both allow for access by an unlimited number of authorized users. Due to the fact that they do not rely on a power source there is never a danger of not being able to open because the power is out or a battery has died. 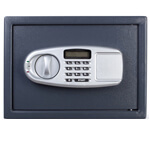 Biometric or passcode models are by far the quickest and easiest to open, especially in the dark or under stress. But both rely on a power source to operate the reader or keypad and both could fail if the necessary power source fails. Some such safes may allow authorizing multiple users but this is not always the case. Now let’s see how some of the most popular models stack up. The following under the best gun safes represent a wide range of what is currently available in style, price and available features. Each has been reviewed based on the important criteria listed above. Hopefully one will meet your needs, if not we hope they will provide you with a benchmark against which other available models can be measures. If you think one of the below models is right for you be sure to use the provided link to check for surrent price and availability on Amazon. Remember when you were a kid and your older siblings told you to be afraid of the monster under the bed? Now that you are all grownup it is not you who needs to be afraid, it are the intruders who threaten you if you have this safe under your bed. This safe is secure, easy to use and big enough to hold an arsenal. Plus it is made in the USA and includes a 7 year manufacturer warranty. The Monster Vault is big- 7’x48’x28- with over 3 cubic feet of storage area. Not only can you fit a wide range of firearms into it it’s 100lb capacity can handle them with ease. Despite its size it is surprisingly low profile and can be easily stored under a standard bed, dresser or even a sofa. The body is constructed of multiple layer of heavy duty rolled steel (12 & 16 gauge).The internal locks are constructed from ½” diameter steel rods, nearly impossible to break or pry.For added security this safe can be bolted to the floor, making it nearly impossible to remove without the necessary tools and considerable time. 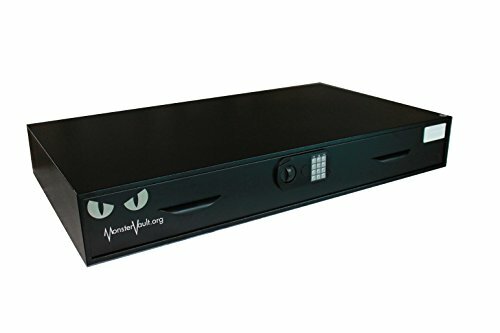 The keypad operated lock is easy to use, even in the dark, and because you custom program the code is perfect when multiple people may need access. If you ever feel the code has been compromised simple reprogram it. Once the code has been entered access is gained via a wide, slide out drawer. Large design is perfect for storage of multiple firearms. Heavy duty steel, multiple layers and steel rod locks make this safe extremely pry resistant. Huge slide out draw for easy access under stress or in the dark. Easy to use keypad can be custom programmed. At 140 lbs it is heavy and needs a secure mounting platform. Once mounted it would be very difficult to reposition. Hornady is best known for a long tradition of offering some of the finest ammunition made using the latest in technology. Although safes may not be the first thing you think of when you hear Hornady you can rest assured they stayed true to tradition by providing the latest in design and technology. This safe is designed to allow storage of both long guns and handguns, with interior dimensions of 40.5”x13.5”x5.5” it is capable of housing 2 of each. Weighting in at only 55lbs this safe is light enough to be relocated when necessary and still heavy enough to provide the feeling it is going to stay in place when you want it to. For added security the safe comes with pre-drilled holes to allow it to be bolted to the floor. 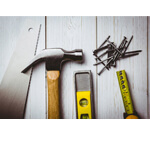 For those who live in rental, or simply to do wish to drill their floors, it can also be secured to any stationary object via included security cable. The real wow factor with this safe is how you access it. Not only are your provided with multiple options but those options include hands free mode- you can open the door without ever using a key, code or combination. By using the included FOB, wristband or stickers, which can be mounted on a cellphone, you can open the door without actually touching it via RFID technology. No wearing your wristband in the middle of the night? No problem, use the programmable keypad or key. No other safe on the market provides so many different options for access. Power is supplied by external AC cord with battery backup. The Rapid Safe is also extremely versatile in that it can be mounted horizontal or vertical. This makes it a perfect fit under a bed or sofa as well as inside a closet. Thanks to the hardened internal lock lugs it is rated as child and pry resistant. It is also ASTM & California DOJ certified. Heavy duty 16 gauge steel construction with locking internal lugs. RFID reader is sensitive, requiring activator to almost touch face before door will open. No rolling drawer, safe must be mounted close to edge of bed frame for access. The designers at SnapSafe set out with a goal – to provide a safe, easily hidden and simple to use method of storing your firearms where you can still get to them. That is exactly what they did with the Under Bed Safe. In terms of providing a safe place to put your guns the Under Bed Safe is nothing if not heavy duty. The 14 gauge steel construction and 100 lb. payload will provide protections for your entire collection. The carpeted interior will ensure your valuables are protected inside and out as well. If you choose to mount it as secure as possible it comes with 4 pre-drilled holes to allow bolting to the floor, or you can use the 3 ft cable for securing to a stationary object. With exterior diminsions of 48”x7”x24” this safe is designed to be hidden under a bed, couch or dresser – out of sight of those who do not need access. 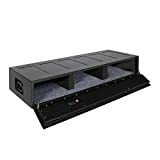 The slide drawer allows for easy access without need to move the safe and even allows for mounting further under the bed than models with flip down doors. It may also be mounted on either side of the bed or even under the foot area- accessible regardless of room configuration. Access is both easy and reliable, bot important features when under stress or operating in the dark. The primary lock operation is via a keypad, simply enter the programmable code and pull the drawer. If for some reason the battery runs low or you are unable to remember the code a key backup is provided. The Under Bed Safe is large enough to store plenty of firearms, either for self-defense or security of the firearms, is easy to mount and can be operated in seconds with either the keypad or key. Everything you are looking for in an under the bed safe. An excellent choice for a basic under the bed gun safe. Rapid keypad operation with key backup. Easy to use roller drawer. Secure 14 gauge steel construction with pry resistant design. Can be bolted or secured via security cable. At 140 lbs. its heavy and may require assistance when moving. Height may require risers to be installed for metal bed frames.